The implementation of corporate social responsibility (CSR) initiatives can turn out to be successful in some organisations and fail for no apparent reasons in others. This research project was conducted with the aim to find out whether these differences can be explained by organisational culture. The impact of culture on CSR involvement was analysed at the example of Hyundai, a global automotive manufacturer. To operationalise the concept of organisational culture, the Cultural Web model was adopted as the core theoretical framework. The survey method was employed for primary data collection. 73 usable questionnaires were collected from the employees of Hyundai’s branch in the UK. Three linear regression models were constructed to establish the influence of the six Cultural Web elements (power structures, organisational structure, control systems, stories, symbols and rituals and routines) on the CSR dimensions of environmental protection, stakeholder communication and employee commitment. Hyundai’s organisational structure and stories were found to produce a positive impact on the environmental protection dimension. The positive effect of rituals and the negative effect of control systems on employee commitment were on the verge of statistical significance. Corporate social responsibility (CSR) is viewed as a highly attractive field, especially for large multinational companies (Chatzoglou et al., 2017; Khan et al., 2015), yet its practical implementation can vary greatly across companies in the same industry or even across subsidiaries of the same corporation (Altuntas and Turker, 2015; Dabic et al., 2016). This research project examines the ways in which the enforcement of CSR can be affected by organisational culture at the example of Hyundai, a global automotive manufacturer. Undertaking this inquiry is justified by the relative scarcity of studies, which focus on the role of organisational culture as a barrier or facilitator of CSR (Said et al., 2017). With a production capacity of 1.6 million units per year, Hyundai is the third largest automobile manufacturer in the world. The company operates in 193 countries and employs over 118,000 people (Hyundai, 2017a). In 2016, Hyundai sold 4.9 million automobiles worldwide earning KRW 93.6 million in revenues and KRW 5.7 million in profits (Hyundai, 2017a). The company has reported about its sustainability initiatives since 2012 (Russo-Spena et al., 2016). In 2016, the key directions of Hyundai’s sustainability effort were reducing air pollution, strengthening mobility/safety care programmes, creating new jobs for unemployed youth and sharing skills to solve social issues (Hyundai, 2017b). The company’s notable achievements include the launch of its first electric vehicle in March 2016 and signing an agreement with the local authority to plant a forest of 30,000-40,000 trees to absorb dust around the metropolitan landfill area (Hyundai, 2017b). However, in 2012, Hyundai was engaged in a scandal related to the inflated fuel economy figures in the advertising of its new and seemingly ‘greener’ products. As a result of this scandal, the company had to reimburse car owners. This background information indicates that Hyundai’s sustainable initiatives are not always enforced consistently across the organisation. The aim of this research project is to examine the impact of organisational culture on corporate social responsibility at the example of Hyundai Motor Company. This goal is accomplished by addressing the following research objectives. To evaluate the role of organisational culture in promoting CSR referring to theory. To identify the key dimensions of corporate social responsibility in the automotive industry. To establish the relationship between the culture elements and CSR involvement in Hyundai. To develop practical recommendations on how to construct a sustainable organisational culture in automotive companies. This dissertation contributes to the knowledge of business ethics and sustainability by collecting up-to-date evidence on how CSR may be affected by organisational culture in the global automotive industry. The practical significance of this work is that it can be used as a guidance for industry practitioners to determine which aspects of organisational culture might facilitate or hinder the implementation of CSR in their company. The questionnaire survey method is applied to collect primary data for this project. 73 filled questionnaire forms have been gathered from Hyundai’s employees. The collected responses are processed using graphical analysis in MS Excel and the linear regression function in the SPSS software package. This dissertation consists of five chapters. The first chapter introduces the research problem, organisational context, aim and objectives, potential contribution and methodology. In the second chapter, only relevant evidence from academic sources is critically evaluated. The third chapter explains the primary research methodology. The key findings are presented, analysed and discussed in the fourth chapter, with conclusions and recommendations provided in the fifth chapter. Numerous models and theories of organisational culture can be divided into the two broad categories, namely ‘typological’ and ‘dimensional’ approaches (Bavik, 2016). ‘Typological’ theories classify organisational cultures into categories according to their distinct characteristics. The examples include Deal and Kennedy’s (1982) culture types classified by the degree of risk and speed of feedback, Handy’s (1993) four cultures defined by the degrees of formalisation and centralisation and the Competing Values Framework (CVF) by Cameron and Quinn (2005). These frameworks are popular with practitioners as they are easily understandable and can provide a quick check of an organisation’s strengths and weaknesses (Buchanan and Huczynski, 2013; Maximini, 2015). A common drawback of the mentioned ‘typological’ approaches is that they are largely descriptive and oversimplified (Bavik, 2016). Besides, the identified categories of cultures might be rather vague or irrelevant to a particular industry, creating a risk of misclassification. Alternatively, ‘dimensional’ theories focus on identifying specific elements of organisational culture (Bavik, 2016). While each culture is assumed to consist of similar components, the nature of these components can vary greatly, shaping a distinct and unique cultural profile of the organisation. One of the most influential ‘dimensional’ frameworks is the three-layer model proposed by Schein (1992). The scholar envisioned organisational culture as the interaction of artifacts (i.e. physical cues and behaviours), espoused values and underlying assumptions and beliefs. This framework is criticised for its understanding that organisational culture cannot be changed by any conscious effort (Alvesson and Sveningsson, 2015). The evidence of successful cultural transformations in real-world companies proves this limitation of Schein’s model (Canato and Davide, 2015). Another well-known ‘dimensional’ framework is the Cultural Web model by Johnson and Scholes (1988). 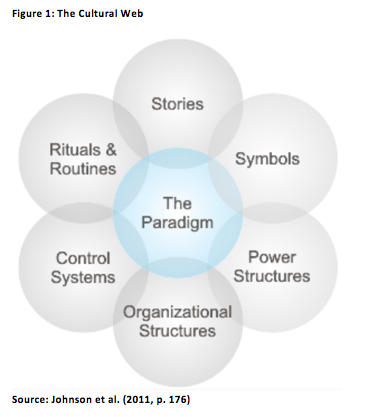 This theoretical approach views organisational culture as resulting from the dynamical interaction of six elements, including organisational structures, power structures, control systems, rituals and routines, stories and symbols (see Figure 1). The major advantage of the Cultural Web model is that it explicitly defines all elements, their interactions and influence on employee behaviour (McDonald and Foster, 2013). In addition, the Cultural Web offers a clear visual representation of organisational culture, which facilitates its understanding by practitioners (Porkka, 2016). As illustrated above, the Cultural Web maps all the elements of culture as overlapping, which contributes to conducting a comprehensive analysis of how well these elements work together (Alvesson and Sveningsson, 2015). Meanwhile, this type of the analysis can be extremely time-consuming because of the large number of questions that have to be asked to the company insiders to properly identify the nature of interactions across the cultural elements (Sun, 2008). This problem limits the applicability of the Cultural Web to empirical research. The idea of corporate social responsibility emerged in the 1990s in response to the highly increasing role and influence of global corporations, which extended far beyond the boundaries of their immediate business (Crane and Matten, 2010). The fundamental assumption of CSR is that businesses should take responsibility for the environmental and social footprint of their operations and mitigate any adverse consequences and delivering value to the communities where they operate (Blowfield and Murray, 2014). Today, CSR is actively adopted by multinational companies not only for moral reasons (Khan et al., 2015), but also because the management expects it to produce a positive impact on the corporate reputation and market share (Kuo et al., 2016). The positive outcomes of CSR reported in the academic literature include enhanced financial performance (Rodriguez-Fernandez, 2016), customer satisfaction (Chatzoglou et al., 2017; Saeidi et al., 2015), employee performance and commitment (Gao and He, 2017; Kim et al., 2017; Terrero-De La Rosa et al., 2017) and innovation (Ratajczak and Szutowski, 2016). However, there is also evidence that the performance gains of CSR can be highly context-dependent rather than universal across companies and industries (Dabic et al., 2016; Ratajczak and Szutowski, 2016). A company’s ability to benefit from CSR initiatives might be determined by its organisational culture, which is the focus of the current research. Conceptually, corporate social responsibility is commonly presented in the literature as the three-dimensional construct encompassing social, environmental and financial initiatives, also known as the ‘triple bottom line’ (González-Rodríguez et al., 2015). An alternative approach was suggested by Marques-Mendes and Santos (2016) who distinguished between ideological, procedural and consequentialist elements of CSR. Although this model has a strong theoretical foundation integrating earlier works in the field, it still lacks empirical evidence proving its reliability. In the context of the global automotive industry, García-Madariaga and Rodríguez-Rivera (2017) identified environment, corporate governance and stakeholder relations as the three critical elements of CSR. Human rights and ethical concerns were collateral factors, which produced no significant impact on the organisational performance of the studied companies (García-Madariaga and Rodríguez-Rivera, 2017). García-Madariaga and Rodríguez-Rivera’s (2017) findings are particularly relevant to this dissertation because they were based on the sample of 16 global automobile manufacturers, including Hyundai. Nonetheless, the data set used by the scholars was historical (2001-2008 years), which means that the observed patterns might no longer be relevant to Hyundai’s present-day performance. An extension to the ‘triple bottom line’ approach was suggested by Chian et al. (2017) who identified four main aspects of CSR in the automotive industry, namely technological, organisational, environmental and culture and human capital. The technological aspect was associated with more energy-efficient manufacturing processes, products and buildings. The environmental aspect referred to the compliance with local environmental legislation and going beyond them to minimise the harmful footprint of the company’s operations, such as carbon emissions (Chian et al., 2017). The organisational aspect covered the selection of sustainable suppliers and communication of the company’s ‘green’ image to customers. The human capital aspect incorporated the commitment to sustainability by managers and staff (Chian et al., 2017). The reliability of this classification is promoted by its reliance on a meta-review of other studies in the automotive industry. However, the differentiation into the technological and environmental aspects is still questionable as they overlap to a significant extent. One more attempt to identify distinct CSR aspects in the global automotive industry was undertaken by Wu (2016). The scholar re-conceptualised CSR as a two-dimensional construct with the dimensions of short-term practices and long-term practices (Wu, 2016). This model might not be particularly useful to guide empirical research, as it is not always possible to make a clear distinction between short-term and long-term initiatives in the CSR strategies of real-world automotive companies. The analysis of the CSR reporting by 19 global automobile manufacturers, including Hyundai, over the 2010-2015 period revealed that the core themes were environmental issues (2,542 mentions), community involvement and development (1,306 mentions) and labour practices (890 mentions) (Russo-Spena et al., 2016). The aspects of organisational governance, human rights, fair operating practices and consumer issues received significantly less attention (Russo-Spena et al., 2016). These results indicate that global automotive companies typically adopt a strong focus on the environment, their personnel and local communities while implementing their CSR strategies. The reliability of Russo-Spena’s et al. (2016) findings is confirmed by the longitudinal time frame and good coverage of the automotive manufacturers. The ‘green’ organisational culture was recognised as a positive antecedent of proactive CSR (opposed to reactive CSR) relying on the sample of 164 manufacturing companies (Chang, 2015). Since the sample was cross-industrial, these findings cannot be extrapolated to the automotive industry. Another concern is related to the vagueness of the ‘green’ culture concept, which lacks a clear definition in the academic literature. Although the Cultural Web framework was not frequently used for the investigation into the relationship between organisational culture and CSR, there is evidence that some elements of this model may influence CSR implementation. Dubey et al. (2017) found that the type of a control system determined the manufacturing companies’ responsiveness to their external pressures for sustainability benchmarking. In particular, the organisations with less flexible controls were more likely to introduce sustainability reporting in response to the coercive and normative pressures (Dubey et al., 2017). The automotive manufacturers with higher organisational ambidexterity were found to achieve stronger environmental performance (Lin and Ho, 2016). Finally, stories told about the organisation by itself to the internal and external stakeholders could enable a seamless integration of the sustainability effort into the existing organisational culture (Bourland-Davis and Graham, 2017). Considering ambidexterity a trait of organisational structure, one can conclude that the positive impact of organisational structures, control systems and stories on sustainability was empirically proved. However, the role of other Cultural Web elements in enforcing CSR still needs to be clarified. The relationship between the identified components of organisational culture and CSR aspects is graphically presented below. 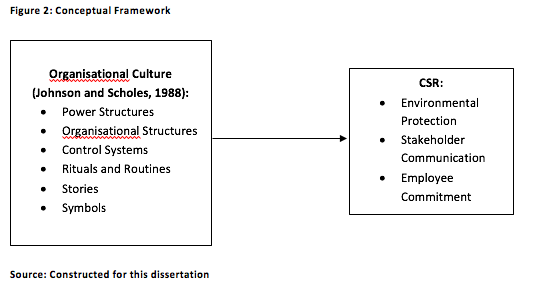 As demonstrated above, the six elements of Johnson and Scholes’ (1988) Cultural Web in their interconnection are hypothesised to positively influence a firm’s CSR involvement, which is measured against environmental protection, external stakeholder communication and employee commitment. This set of the variables was developed relying on the recent research on the automotive industry (Chian et al., 2017; García-Madariaga and Rodríguez-Rivera, 2017). The epistemology of positivism is selected to guide this inquiry for several reasons. Firstly, this philosophical stance enables the researcher to minimise the impact of personal values and feelings on the interpretation of findings and allows for achieving the highest degree of objectivity (Ghauri and Gronhaug, 2005). Secondly, positivist studies follow a highly structured methodology, which makes them more feasible for less experienced researchers (Saunders et al., 2007). Thirdly, positivist research is generally perceived as more credible and scientifically rigorous because of its focus on establishing quantitative relationships between the observable factors (Easterby-Smith et al., 2012). The main limitation of positivism is that the factors involved in social and business analysis may be difficult to quantify (Nandagopal et al., 2009). The researcher managed to address this issue by using the Likert scale methodology in the case of Hyundai’s organisational culture and CSR. This project also follows the deductive research approach, testing general theory of organisational culture and CSR in the specific setting of Hyundai. The variables that are included in the conceptual framework (see Figure 2) were extensively examined by past researchers, with a large body of knowledge accumulated, which prompts the choice of deduction (Bryman and Bell, 2010). Besides, deductive studies are generally less protracted in time, which is particularly important for academic projects that have to be completed within a short time period (Saunders et al., 2007). An essential drawback of deduction is that it limits the scientific novelty of findings, as completely new insights are unlikely to be obtained in this type of studies (Collis and Hussey, 2014). The purpose of this dissertation is to establish possible links between the variables that were identified in the literature review. This type of inquiry is known as explanatory research and it usually involves quantitative data collection (Robson, 2002). To summarise, only quantitative primary data is collected for this project, which is also consistent with the positivist philosophy and deductive approach (Collis and Hussey, 2014). The questionnaire survey strategy is preferred to other alternatives such as observation or experiments because of its ability to reach a large population in a cost-effective way (Easterby-Smith et al., 2012). In order to arrive at statistically significant conclusions, the researcher needs to engage at least 30 randomly selected individuals from the target population (De Vaus, 2002). One of the main problems of surveys is their low response rate, which does not typically exceed 30% for self-administered surveys (Saunders et al., 2007). The author of this investigation addressed this drawback by sending out a sufficient number of invitations to arrive at the target number of responses. Another limitation is the possibility of the findings to be distorted by respondent bias (Jankowicz, 2005). To minimise this risk, the researcher ensured the full anonymity and confidentiality of all participants so that to manage their worries and concerns. The designed questionnaire forms (see Appendix A) were posted online on Survey Monkey. The researcher used personal contacts within the target organisation to distribute the invitation message containing a web link to the survey to 200 randomly selected employees within Hyundai’s branch in the UK. Over the next two weeks, 73 employees completed the survey. This means that the response rate was equal to 36.5%, which is better than average. The key variables integrated in the questionnaire can be defined as follows. As demonstrated above, each question contained a variable. 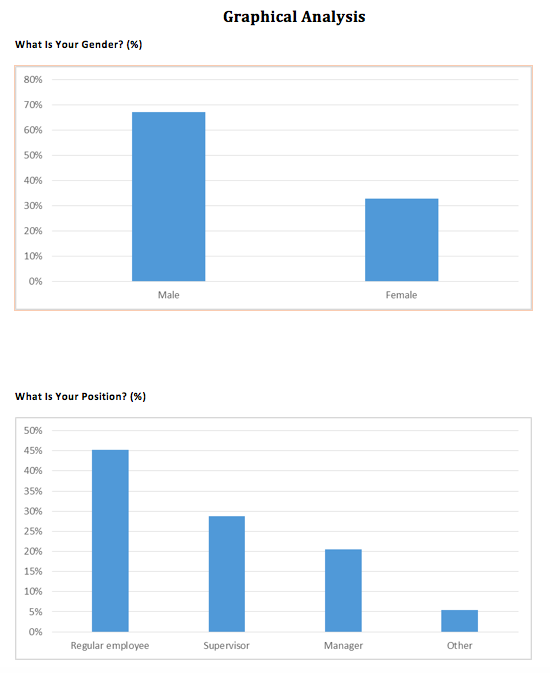 The first four questions were asked to construct a demographic profile of the sample. Questions 5-10 measured the six elements of Johnson and Scholes’ (1988) Cultural Web and were included in the regression models as independent variables. The last three questions evaluated the prominence of the key CSR dimensions at Hyundai. The CSR aspects were used as dependent variables in the regression analysis. Three multiple linear regression models were constructed in the SPSS software package to analyse the impact of the organisational culture elements on each CSR aspect in the focus company. It should be explained that α0 is a constant, β1, 2…6 are indicators influencing the independent variables PS, OS, CS, RR, ST and SM (i = 1, 2, 3…73), and ε is residuals. Descriptive statistics and graphical analysis are applied as additional tools to determine the manifestation of various CSR aspects in Hyundai’s daily operations. The researcher obtained a formal consent from the management of Hyundai to collect data in the organisation. The questionnaire form (see Appendix A) did not include any personal questions, and the respondents remained anonymous and could not be identified in person. All the participants were informed about the purpose and scope of this investigation. Thus, the respondents’ consent to participate in the survey, which they gave by clicking the ‘Start’ button, can be considered as fully informed. The collected data was not shared to any third party including Hyundai’s managers, or published otherwise than in this dissertation. The information was stored on the researcher’s personal computer and protected with a password to prevent any unauthorised access. As it may be grasped from the histogram below, younger age groups dominated in the sample. The largest employee group (32.9%) in the sample was aged 26-35; the next largest group (26%) included those aged 36-45. 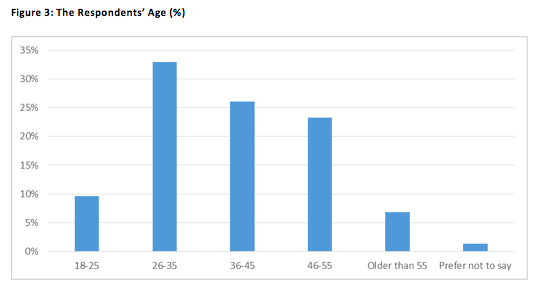 Overall, 42.5% of the respondents were 35 or younger, and only 6.9% were older than 55. 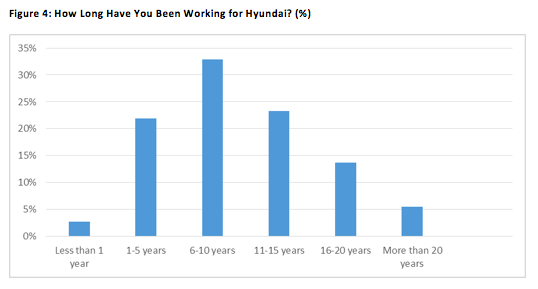 This distribution of the responses indicates that Hyundai’s employment practices are favourable towards young and middle-aged individuals. Two thirds (67.1%) of the employees who completed this survey were males, which is consistent with the general prevalence of men in heavy manufacturing industries. 45.2% were regular employees, 28.8% were supervisors, and 20.6% were managers (see Appendix B). 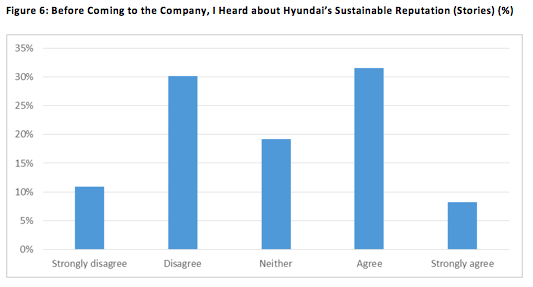 The strong representation of those employed at the upper levels of the hierarchy increases the likelihood that the respondents are well-informed about Hyundai’s sustainability practices. The majority of the respondents had worked for the company for quite a long period of time. As demonstrated in the graph, the distribution of the respondents according to their tenure was close to normal, with the largest group (32.9%) working for Hyundai for 6-10 years. The next largest groups were those employed for 11-15 and 1-5 years. Only 2.7% of the survey participants were in their first year of employment, and 75.4% had worked for Hyundai for more than 6 years. It can be concluded that the survey population possessed sufficient knowledge of the company’s sustainability practices in its dynamics. The descriptive statistics for the all research variables is presented in the table below. The highest means were calculated for the variables of organisational structure (OS), employee commitment (EC) and power structure (PS), which demonstrates that the researcher’s assumptions about these factors were accurate. The means of the stories (ST) and symbols (SM) variables were the lowest, indicating the roughly equal proportions of agreements and disagreements. The most ambiguous respondents’ attitudes were observed with respect to stakeholder communication (SC), control systems (CS) and environmental protection (EP) at Hyundai, which is reflected in large standard deviations. By contrast, the respondents’ ideas about organisational structure and employee commitment were the most uniform, with small deviations computed for these variables. The first regression model was constructed to examine the impact of the culture elements on the environmental protection at Hyundai. The environmental protection effort of Hyundai was positively predicted by the company’s organisational structure (B=0.538; t=3.474; Sig.=0.001) and stories (B=0.314; t=2.643; Sig.=0.01). Other elements of Johnson and Scholes’ (1988) Cultural Web produced no significant effect on the dependent variable of environmental protection, with their p-values far above 0.05. This regression model was reliable according to the F-test results (F=3.700; p=0.003). The R-square value was computed at 0.252, which indicates that the identified cultural factors explained 25.2% of variance in the dependent variable. The second regression model examined the impact of the culture elements on stakeholder communication at Hyundai. As demonstrated above, none of the culture elements reliably predicted the stakeholder communication in the analysed company. The significance levels of all independent variables were considerably higher than 0.05. This outcome suggests that the impact of Hyundai’s organisational culture on its stakeholder communication might be negligible (e.g. because the company mimics the best practices of other major players in the industry in its sustainability reporting). An alternative explanation is that the Cultural Web model is not particularly tailored to examine this kind of impact. The impact of the culture elements on Hyundai’s employee commitment was examined by the third regression model. As demonstrated by the chart, employee commitment to Hyundai’s CSR initiatives was positively affected by rituals and routines (B=0.204; t=2.218; Sig.=0.030) and negatively by the company’s control systems (B=-0.175; t=-2.197; Sig.=0.032). These findings indicate that Hyundai can enhance employee commitment by engaging workers in sustainable activities and by shifting to more flexible controls. The third regression model was close to significance (F=1.910; p=0.092), which means that the established relationships cannot be accepted as fully reliable and need further empirical testing (e.g. in another Hyundai’s department or in a different automotive company). The survey results provided evidence that the power structure of Hyundai is highly centralised. 43.8% of the respondents agreed and 23.3% strongly agreed that the strategic direction of the company was determined exclusively by the top management (see Appendix B). Even more positive responses amounting to 75.3% of the sample were received regarding the relationships inside the company being formal and hierarchical (Appendix B). 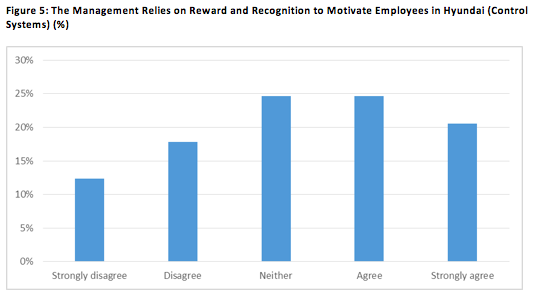 Considering the control systems, 24.7% of the survey participants agreed and 20.6% strongly agreed that the management at Hyundai relied on reward and recognition to motivate employees (Figure 5). The distribution of the responses was skewed to the right, providing support to the researcher’s assumption about motivation at Hyundai. This focus on external motivation is consistent with the company’s centralised power structure and hierarchical organisational structure (Johnson et al., 2011). However, the difference between neutral and negative responses to this question was more visible as compared with the previous two questions (see Appendix B), meaning that the control systems might be enforced at Hyundai less consistently than the remaining elements of culture. Responding to the question about their personal involvement in the sustainable activities organised by Hyundai, 34.2% of the survey participants selected the neutral option (see Appendix B). At the same time, the percentage of agreements was also high (42.4%), which indicates a high degree of employee engagement in sustainable rituals and routines. The question about stories elicited highly polarised responses as shown in Figure 6. The respondents split almost equally between the positive and negative options with respect to stories, which shows that this element of Hyundai’s organisational culture might not be promoted effectively. 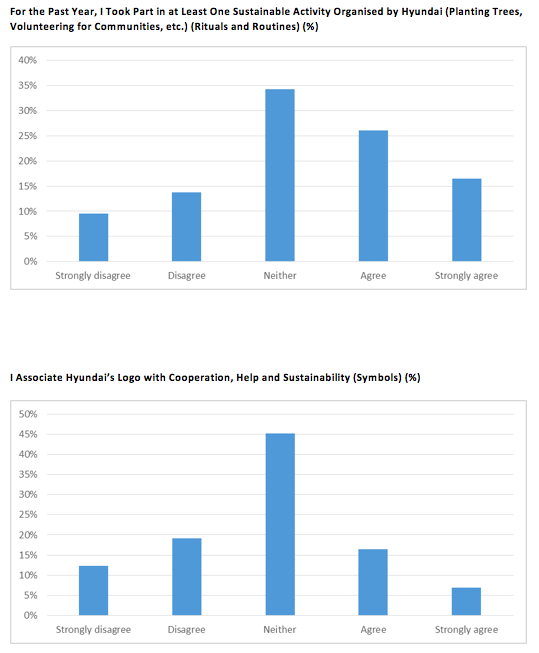 Interestingly, a relatively small part of the respondents (23.3%) agreed or strongly agreed that they associated Hyundai’s logo with cooperation, help and sustainability (Appendix B). The proportion of neutral responses to this question was the highest in the whole survey (45.2%), prompting that Hyundai is experiencing perception challenges. These survey results suggest that the company has not been able to use the symbol dimension of its organisational culture to construct its sustainable image. Hyundai’s environmental protection efforts were rated high by the survey respondents. 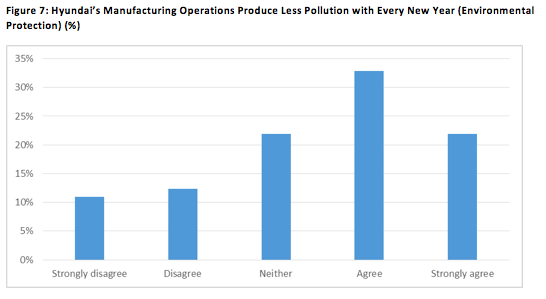 Specifically, 32.9% of the sample agreed and 21.9% strongly agreed that the company’s manufacturing operations produced less pollution with every new year (see Figure 7). 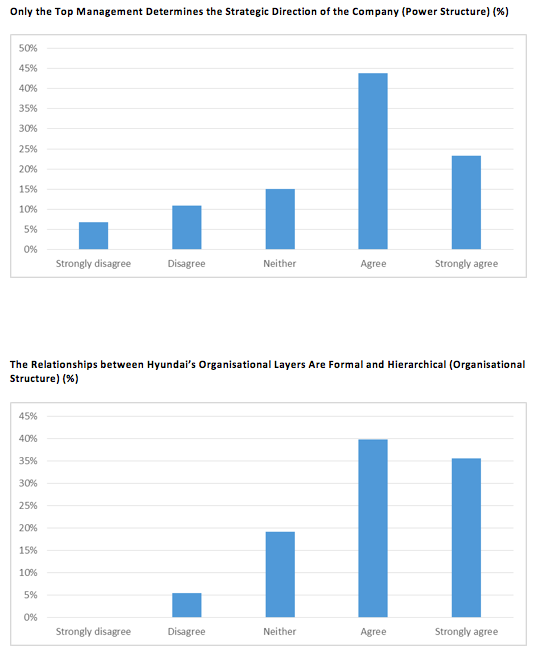 The distribution of the positive and negative responses to this question about stakeholder communication was almost equal (Appendix B), indicating that Hyundai’s communication might be effective in terms of reaching some stakeholder groups and ineffective with respect to others. 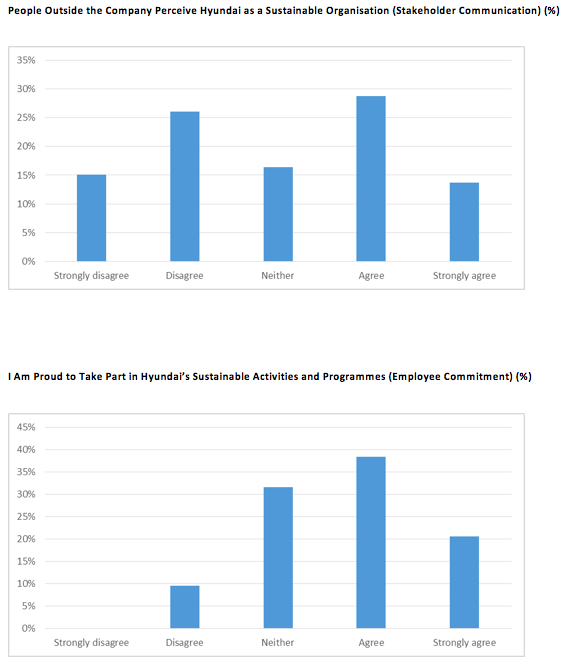 The employee commitment to Hyundai’s sustainable activities and programmes was considerable, with 59% of the respondents being proud to participate in them (Appendix B). Thus, the conducted survey revealed a relatively high degree of CSR involvement at Hyundai. The results of the regression analysis provided evidence of a positive relationship between the elements of Hyundai’s organisational culture and its CSR involvement. Reducing the ecological footprint of Hyundai’s operations was positively influenced by its organisational structure and stories. The hierarchical organisational structure of the company might facilitate the implementation of sustainable initiatives across the broad geographic span of Hyundai’s operations (Johnson et al., 2011). The effect of organisational stories on CSR in this study aligns with that established by Bourland-Davis and Graham (2017) in a different industrial setting. The stories told about Hyundai as a sustainable organisation are likely to promote employee commitment, which in turn results in better environmental performance. This explanation is apparently challenged by the insignificant relationship established between the story element and employee commitment to sustainability in Regression Model 3. However, the impact of organisational stories on commitment might be implicit and; hence, not fully rationalised by the employees (Alvesson and Sveningsson, 2015), which contributed to this unexpected result. Remarkably, control systems were identified as the only element of Hyundai’s organisational culture producing a negative effect on its CSR. More specifically, the reward-based control system in the company negatively affected the employee commitment dimension of CSR. This influence is consistent with the findings obtained by Dubey et al. (2017). While companies with tighter controls are more likely to introduce sustainability reporting in response to their external pressures, the internal motivation for implementing CSR among their employees is generally lower (Dubey et al., 2017). Hyundai was one of the latest adopters of public sustainability reporting in the global automotive industry (Russo-Spena et al., 2016), which can be interpreted as the company’s responding to the normative pressure. A shift to the human-centred control system could arouse higher internal motivation for the CSR compliance among Hyundai’s employees. The positive impact of Hyundai’s rituals and routines on employee commitment to CSR is a predictable result, considering that 42.4% of the survey population reported about taking part in the sustainable activities organised by the company recently. A number of earlier research studies discovered a positive relationship between employee engagement and commitment to CSR initiatives (Gao and He, 2017; Kim et al., 2017; Terrero-De La Rosa et al., 2017). However, an important pre-caution in interpreting this outcome of the regression analysis is that the model was on the verge of significance. Therefore, further empirical testing is needed to verify the established relationship. The survey results revealed that Hyundai had been successful in reducing the ecological footprint of its operations and promoting the employees’ commitment to sustainability. The company’s stakeholder communication was rated lower by the survey participants. Hyundai’s organisational structure and stories strongly contributed to the environmental dimensions of its CSR. The employee commitment dimension was positively influenced by the rituals and routines variable and negatively by the firm’s control systems, which were mainly reward-based. Nevertheless, the regression analysis results for the employee commitment dimension were on the verge of significance and should be tested through further empirical inquiry. The power structure and symbols of Hyundai produced no significant impact on any of the CSR dimensions. The major limitation of this study is related to its scope, which covers only a single branch of a single automobile manufacturer. As a result, the established relationships cannot be generalised to other automotive companies. The next notable limitation arises from the quantitative research method. The collected insider perspectives lacked depth and did not reveal any novel detail about Hyundai’s CSR effort. The survey results could be affected by the varying degrees of CSR awareness and commitment within the employee sample. The researcher considered these drawbacks in preparing recommendations for future research. The results of this dissertation vividly demonstrate that building a sustainable organisational culture within a large automotive company requires a close attention to each element of the Cultural Web. The positive effect on sustainability produced by some culture elements can be downsized by the negative effect produced by other elements. To increase the employee commitment to CSR and foster internal motivation for compliance, it is recommended that companies transit from reward-based to human-centred control systems. Another effective strategy is to engage employees in sustainable rituals and routines on a regular basis. A hierarchical organisational structure and inspiring stories can be useful for promoting the environmental compliance across geographically dispersed divisions. The inherent limitations of this study outline several directions for future research. Firstly, the qualitative method with semi-structured interviews may be adopted to collect more detailed and insightful data from the company insiders. Secondly, future researchers can stick to the quantitative method, but collect samples from several global automotive companies or from several divisions of the same company. This scope of future research will allow for investigating how the impact of organisational culture on sustainability might vary across companies and national contexts. Thirdly, accessing a larger employee sample from Hyundai and using differently worded questions can be helpful to test the relationships that were on the verge of significance in this project. Finally, an alternative model of organisational culture can be adopted as the core theoretical framework to see whether it will be more relevant to explaining the relationship between culture and sustainability for global automotive manufacturers. Altuntas, C. and Turker, D. (2015) “Local or global: analysing the internationalisation of social responsibility of corporate foundations”, International Marketing Review, 32 (5), pp. 540-575. Alvesson, M. and Sveningsson, S. (2015) Changing organisational culture: cultural change work in progress, London: Routledge. Blowfield, M. and Murray, A. (2014) Corporate responsibility, 3rd ed., Oxford: Oxford University Press. Bourland-Davis, P. G. and Graham, B. L. (2017) “Examining public relations’ role in shaping organisational culture, with implications for PR, HR and CSR/sustainability”, in D. Pompper (Ed. ), Corporate social responsibility, sustainability and ethical public relations, Bingley: Emerald Publishing Limited, pp. 199-219. Buchanan, A. A. and Huczynski, D. A. (2013) Organisational behaviour, 8th ed., Harlow: Pearson Education. Cameron, K. S. and Quinn, R. E. (2005) Diagnosing and changing organisational culture based on Competing Values Framework, San Francisco: Jossey-Bass. Canato, A. and Davide, R. (2015) “Managing long-lasting cultural changes”, Organisational Dynamics, 44 (1), pp. 75-82. Chang, C.-H. (2015) “Proactive and reactive corporate social responsibility: antecedent and consequence”, Management Decision, 53 (2), pp. 451-468. Chatzoglou, P., Chatzoudes, D., Amarantou, V. and Aggelidis, V. (2017) “Examining the antecedents and the effects of CSR implementation: an explanatory study”, EuroMed Journal of Business, 12 (2), pp. 189-206. Chian, N. S., Aziati, A. H. and Yusof, S. M. (2017) “Factors affecting implementation of green manufacturing for Malaysian automobile manufacturers: a literature review from 2010 until 2015”, The Social Sciences, 12 (7), pp. 1293-1298. Crane, A. and Matten, D. (2010) Business ethics: managing corporate citizenship and sustainability in the age of globalisation, 3rd ed., Oxford: Oxford University Press. Dabic, M., Colovic, A., Lamotte, O., Painter-Morland, M. and Brozovic, S. (2016) “Industry-specific CSR: analysis of 20 years of research”, European Business Review, 28 (3), pp. 250-273. De Vaus, D. A. (2002) Surveys in social research, 5th ed., London: Routledge. Deal, T. E. and Kennedy, A. A. (1982) Corporate cultures: the rites and rituals of corporate life, Reading: Addison-Wesley. Dubey, R., Gunasekaran, A., Childe, S. J., Papadopoulos, T., Hazen, B., Giannakis, M. and Roubaud, D. (2017) “Examining the effect of external pressures and organizational culture on shaping performance measurement systems (PMS) for sustainability benchmarking: some empirical findings”, International Journal of Production Economics, 193 (1), pp. 63-76. Gao, Y. and He, W. (2017) “Corporate social responsibility and employee organisational citizenship behaviour: the pivotal roles of ethical leadership and organisational justice”, Management Decision, 55 (2), pp. 294-309. García-Madariaga, J. and Rodríguez-Rivera, F. (2017) “Corporate social responsibility, customer satisfaction, corporate reputation, and firms’ market value: evidence from the automobile industry”, Spanish Journal of Marketing, 21 (1), pp. 39-53. Ghauri, P. and Gronhaug, K. (2005) Research methods in business studies: a practical guide, 3rd ed., London: Prentice Hall. González-Rodríguez, M. R., Díaz-Fernández, M. C. and Simonetti, B. (2015) “The social, economic and environmental dimensions of corporate social responsibility: the role played by consumers and potential entrepreneurs”, International Business Review, 24 (5), pp. 836-848. Handy, C. (1993) Understanding organisation, 4th ed., Harmondsworth: Penguin Books. Hyundai (2017a) “About Hyundai”, [online] Available at: https://www.hyundai.com/worldwide/en/about-hyundai/ir/ir-overview [Accessed on 24 November 2017]. Hyundai (2017b) “Road to sustainability: 2017 sustainability report”, [online] Available at: http://csr.hyundai.com/upfile/report/sar/Sustainability_Report_en_2017.pdf [Accessed on 24 November 2017]. Jankowicz, A. D. (2005) Business research projects, 4th ed., London: Thomson Learning. Johnson, G. and Scholes, K. (1988) Exploring corporate strategy, Upper Saddle River: Prentice Hall. Johnson, G., Whittington, R. and Scholes, K. (2011) Fundamentals of strategy, 2nd ed., Upper Saddle River: FT Press. Khan, Z., Lew, Y. K. and Park, B. I. (2015) “Institutional legitimacy and norms-based CSR marketing practices: insights from MNCs operating in a developing economy”, International Marketing Review, 32 (5), pp. 463-491. Kim, H. L., Rhou, Y., Uysal, M. and Kwon, N. (2017) “An examination of the links between corporate social responsibility (CSR) and its internal consequences”, International Journal of Hospitality Management, 61 (1), pp. 26-34. Kuo, T. C., Okudan Kremer, G. E., Phuong, N. T. and Hsu, C.-W. (2016) “Motivations and barriers for corporate social responsibility reporting: evidence from the airline industry”, Journal of Air Transport Management, 57 (1), pp. 184-195. Lin, L.-H. and Ho, Y.-L. (2016) “Institutional pressures and environmental performance in the global automotive industry: the mediating role of organisational ambidexterity”, Long Range Planning, 49 (6), pp. 764-775. Marques-Mendes, A. and Santos, M. J. (2016) “Strategic CSR: an integrative model for analysis”, Social Responsibility Journal, 12 (2), pp. 363-381. Maximini, D. (2015) The scrum culture: introducing agile methods in organisations, Zurich: Springer. McDonald, S. and Foster, R. (2013) “The use of Johnson’s Cultural Web to improve understanding of organisational culture: a critical review”, International Journal of Management, 30 (4), pp. 340-354. Nandagopal, R., Rajan, A. and Vivek, N. (2009) Research methods in business, New Delhi: Excel Books India. Porkka, P. (2016) “Functional model for organisational and safety culture”, The Italian Association of Chemical Engineering, pp. 907-912. Ratajczak, P. and Szutowski, D. (2016) “Exploring the relationship between CSR and innovation”, Sustainability Accounting, Management and Policy Journal, 7 (2), pp. 295-318. Robson, C. (2002) Real world research, 2nd ed., Oxford: Blackwell. Rodriguez-Fernandez, M. (2016) “Social responsibility and financial performance: the role of good corporate governance”, BRQ Business Research Quarterly, 19 (2), pp. 137-151. Russo-Spena, T., Tregua, M. and De Chiara, A. (2016) “Trends and drivers in CSR disclosure: a focus on reporting practices in the automotive industry”, Journal of Business Ethics, 1 (1), pp. 1-16. Saeidi, S. P., Sofian, S., Saeidi, P., Saeidi, S. P. and Saeidi, S. A. (2015) “How does corporate social responsibility contribute to firm financial performance? The mediating role of competitive advantage, reputation, and customer satisfaction”, Journal of Business Research, 68 (2), pp. 341-350. Said, R., Joseph, C. and Sidek, N. (2017) “Corporate governance and corporate social responsibility (CSR) disclosure: the moderating role of cultural values”, in D. Crowther and S. Seifi (Eds), Modern organisational governance, Bingley: Emerald Publishing, pp. 189-206. Saunders, M., Lewis, P. and Thornhill, A. (2007) Research methods for business students, 4th ed., London: Pearson Education. Schein, E. (1992) Organisational culture and leadership: a dynamic view, San Francisco: Jossey-Bass. Sun, S. (2008) “Organisational culture and its themes”, Ludong University, pp. 137-141. Terrero-De La Rosa, A., Santiago-Ortega, R., Medina-Rivera, Z. and Berrios-Lugo, J. (2017) “Corporate social responsibility practices and programmes as a key strategic element in organisational performance”, in L. M. Gomez, L. Vargas-Preciado and D. Crowther (Eds), Corporate social responsibility and corporate governance, Bingley: Emerald Publishing, pp. 223-247. Wu, L. (2016) “A two-dimensional three-level sustainability framework for achieving short- and long-term gains: empirical evidence from the Chinese automotive sector”, PhD thesis, University of Nottingham.